Mass protests, civil disobedience and rebellions have been taking place in Ferguson and other parts of the United States since August 9 of last year when 18-year-old Michael Brown was gunned down by white police officer Darren Wilson. Despite a St. Louis County grand jury investigation and a probe by the federal government, Wilson, who resigned as well from the police department, has not been charged with any criminal offense. Chief Jackson stepped down in the wake of a scathing Department of Justice report that documented systematic racial profiling and collusion targeting the majority African American population in Ferguson and other suburbs in St. Louis County. Activists have been demanded the removal of Jackson along with the mayor of the city. 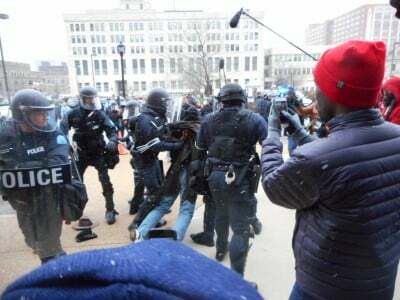 As the crowd was thinning out during the early hours of March 12, shots rang out fired from a distance hitting two officers. Police immediately sought to connect the wounding of the officers to the anti-racist demonstrations. St. Louis County Prosecutor Robert McCulloch claimed that Jeffrey Williams conveyed to authorities he was firing at someone else that he had a dispute with, and not at the police officers. “We’re not sure we completely buy that part of it,” McCulloch retorted, saying his office believed that there were others in a vehicle with the prime suspect. Mayor James Knowles is the target of a recall campaign according to a twitter message from the Organization for Black Struggle, an area activist group which has been at the center of mass demonstrations against police violence. Knowles has stated repeatedly that he has no intentions of resigning despite the departure of police officers, civil servants, a municipal judge, the police chief and the city manager in recent weeks. Also there are three seats up for elections on the Ferguson City Council and some local leaders are seeking to mount campaigns to take those positions. Some believe that this is the best route to making reforms by electing officials to local governmental positions. Nonetheless, it was the mass demonstrations and rebellions that have swept St. Louis County and other cities throughout the country that has brought attention to the ongoing problem of racism and national oppression in the U.S. to people around the world. Historical lessons from other cities which have elected African American mayors, city councilpersons, county, state and congressional representatives over the last nearly five decades, suggests that until the structural problems of unemployment, poverty, police violence directed at oppressed communities, corporate impunity and predatory lending is overthrown there is little hope for fundamental change aimed at enhancing the living standards and fostering stability in the current period.